SunCommon's Warehouse team keeps our equipment and installations moving across the region ensuring that more folks can go solar! 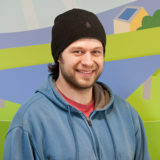 Evan is a native Vermonter, having grown up on a small dairy farm in Enosburg Falls, VT. While he’s visited many places, there is only one Vermont. Before coming to SunCommon, Evan worked in a variety of roles ranging from retail management, shipping, and labor. His hobbies include reading, cooking, hiking and traveling, despite not being very good at any of it. Evan currently lives in the South End of Burlington, where he can be seen frequently at the local breweries, downtown or at Oakledge beach, enjoying many of the perks of living here in the Green Mountains.